In this article we are going to talk about the different calligraphic alphabets in western calligraphy (Latin alphabet). The purpose of this post is to present you a variety of different scripts that you can start learning and doing further research on. It’s important to understand that different calligraphic alphabets appeared in different periods throughout history. Instead of just mentioning a bunch of different calligraphy scripts, we are going to take you back in time, and give you a chronological overview of the major calligraphy scripts. Get ready to travel back in time, and learn more about the rich history of calligraphy! There are a few things that i would like to mention. Reviewing more than 2000 years of history in a single article is quite difficult, and obviously we compressed the whole thing and just mentioned the most influential scripts. For each script we are going to provide additional resources (if any) for you to learn from. While researching for the information for this article (online, books, videos) I’ve noticed that different sources sometimes give different information (especially when talking about dates and years). In case you believe that we made a mistake in this article, please do not hesitate to reach out – we would really appreciate that. In this article we solely focus on Western calligraphy (the Latin alphabet), and how it developed throughout more than 2,000 years of history. We are going to have a closer look on some of the most influential scripts that are popular and still practiced today. The term hand is used to describe how the script is interpreted by the writer. It’s also important to mention that a specific calligraphy script can be done in different styles. Our friend Jake Rainis created a perfect example of how the same calligraphy script can be done in multiple styles. Jake is an amazing calligraphy artist specializing in blackletter (gothic) scripts. He also runs a blog that is just packed with value on different calligraphy topics. These are some of the the most influential historical periods that impacted the development of calligraphy. We are going to go (briefly) through each of these periods and mention the most important scripts. The Latin alphabet dates back to around 700 BC (Before Christ) and around the first century AD in Rome, the Roman Square Capitals emerged. Even though it’s one of many scripts from that era, it is by far the single most influential historical script. The beauty and the key of these letters lay in geometry and precision, one could say it reflects the finesse of the architecture and culture of that era. This script served as fundamental basis for the historical development of the Latin alphabet, and essentially the way we communicate in writing today. Along with the Square Roman Capitals we can distinguish another very influential (similar) script called the Rustic Capital. Opposed to the Square Roman Capitals that were being used for stone engraving and more formal occasions. Several hundred years later ( second or third century AD) a new script developed influenced by the Greek alphabet. The Uncial script was one the early alphabets used in Christian texts and aside from its beauty, it was a more practical and speedily written script, ideal for example – copying the Holy Bible or other manuscripts. It is characterized by bold and curved strokes, and it took less strokes to complete a letterform compared to the Roman Capitals. I find it extremely fascinating how the alphabet developed according to their need. You can find more great examples on Pinterest. As the Roman Empire spread across other European countries through the coming years, it has eventually reached the northern parts of Europe, including England – bringing their language and the Roman alphabet. Over the following centuries, Western Europe entered in the dark ages which followed with a decline of the Roman Empire. During this period a new script developed that was influenced by the Uncial script, yet it developed its own characteristics – one of them being ligatures (connecting strokes). The Beneventan script originated from the southern parts of Italy and it was one of the longest lasting Post Roman scripts. One of the most important scripts of the medieval era was the Carolingian script that was developed during the ruling of Charlemagne in the late eighth century. 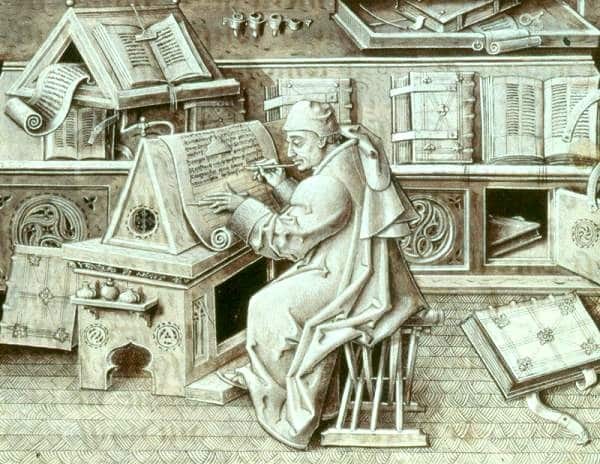 Charlemagne assigned Alcuin (Monk of York) to be his librarian and teacher, and to copy both religious texts and manuscripts as well as other texts of science and literature dating from the Greek and Roman era. Alcuin along with his team of scribes in a scriptorium based in Tours (France) developed a more streamlined script that served as a basis for the lower case alphabet that we use today. Another important mention of this era is the Insular script. A medieval script that developed in Ireland, and it was influenced by the scripts from the Roman era. This particular script was under the influence of Irish Christianity which helped spread the script across England as well as the continental Europe. Following the post Roman era, a new script developed in Northern Europe (12th century). The Gothic scripts are VERY popular in today’s age, practiced by many calligraphers – there are several different scripts (styles) that developed throughout this time period (see below). The Gothic script grew out of Protogothic and Romanesque period. Gothic had its influence from the Carolingian script during the Charlemagne era. However, this time the changes were more noticeable in the new Gothic script. Characterized by a more compressed, thick, straight and angular shapes, it was the opposite compared to the round shapes that characterized the Carolingian script. The Carolingian script although it was a beautiful script, it was time consuming and it took more space of page due to its round shapes and counter parts. Once again, the way of writing was adapted towards the current need of the people – which at the time was a higher demand of handwritten books. Blackletter (Gothic) scripts also include different (similar) styles such as – Textura Quadrata, Textura Presciscus, Batarde, Fraktur, Rotunda, etc. By now the Gothic became the new way of writing across Europe. Books and legal documents were in high demand, and at that time the scribes were the only people who could perform such tasks. Scribes and book producers formed into guilds, and soon enough they had a monopoly over book production and legal documents – thus made them very powerful at the time. One of the most crucial events in the second millennium was the invention of the printing press. A revolutionary invention by Johannes Gutenberg that brought prosperity to the world but put an end to the scribe. The printing press (and movable type) broke the monopoly and simply no scribe could compete with a machine. The printing press could run more than a hundred pages within an hour while the scribe could only do one. This was a massive upgrade that allowed millions of books to be printed in a very short period of time. As the year passed the middle ages came to an end, and a new era arrived. An era of ‘’rebirth’’ for Western Europe and upcoming prosperity in major human activities, such as art, science, economy, etc. At the time the gothic script that was developed in Northern Europe, was the dominant hand being used, however, that particular way of writing did not really resonated with the Italians. There was one scholar in particular who considered the Gothic to be rather unpractical and who openly criticized it in his manuscripts. His name was Francesco Petrarca. Petrarca described it as a script that has an appeal to the eye from distance, but creating fatigue from up close, and that it’s purpose should be for something else than reading. Francesco also argued that writing should be clear, simple and orthographically correct (to be honest, I’m not really sure i understand what he meant by that). These were the notions that gave birth to the Humanist minuscule. It is said that this is one of the most significant and defining of all Western scripts. It was very popular in Italy at the time and this script presented a model for the Venetian typeface. The Humanist minuscule was influenced by the Carolingian hand, as the scholars of that time period were particularly keen on perceiving themselves as the inheritors of the antique era. The Cancellaresca script was another major update in the way people write. It was particularly innovative because it improved as a script in terms of functionality and speed of writing. Scholar Niccolò de’ Niccoli was dissatisfied with how laborious the Humanist minuscule was, so he created a slanted script that required fewer strokes and that could be joined with other letters. One of the biggest changes was made to the lowercase letter a, which was quite different from the one in Humanist minuscule script. Another very important mention about the Cancellaresca script is that it served as a base for cursive writing that we teach and use today. If you want to learn the Italic hand, there is this really cool online (video) course by Jackson Alves, that will teach you the basics and how to get started. The best part is that you can watch the whole thing for free! After the period of Rennaisance, the Cancellaresca Corsiva provided the foundation for a new script to be developed. The word “cursive” is derived from the Medieval Latin word “cursivus”, which translates to “running”. During the sack of Rome (1527) many scribes moved to the southern parts of France where they developed the Italic Cancellaresca which was later adapted to the French style Rhonde in the early 17th century. It wasn’t until the end of the 17th century when books with the French Rhonde script reached England, where John Ayres and William Banson refined their interpretations of the French script. During the following years and with the help of fellow writing masters such as Goerge Bickham, the English Roundhand spread across the world, due to British Mercantile Trade. The name Copperplate originates back from when the writing was engraved on plates made out of copper, which writing masters would use for printing samples of their beautiful work. It was being done this way, because printing machines and movable type could not reproduce (yet) such complexity and variations of styles. On the iampeth.com website you can find much more information on the history of this particular script as well as steps on how to get started. This is a script originating in the United States developed in the 19th century by Platt Rogers Spencer. Platt Roger Spencer developed a style of penmanship that was used as a standard of writing for nearly a hundred years – up until the point the typewriting machine came along in the 20th century. What made this script so popular and influential was not only its beauty but also the functionality that lays behind the way you write it. FUN FACT – it is said that the Spencerian script served as an influence point for the Coca-Cola logotype, which we all know that is one of the most iconic logotypes in the world. In this article, Dr. Joseph Vitolo talks more in depth about the Copperplate and Spencerian scripts (as well as their differences) with plenty of examples. Although it seemed that machines have turned writing by hand obsolete, calligraphy took a variety of different directions such as advertisement and demand in novelty for type design. We mark the modern era from the beginning of the 20th century with pioneers such as Edward Johnston and Rudolf Koch – also known as the fathers of modern calligraphy. A lot of new developments occurred in the last 100+ years and it would really drag this article out if we were to cover all of it. Instead we are going to stick to the most impactful developments. This hand is set to be one of the most iconic alphabets in the whole realm of calligraphy alphabets due to its clear defined characters. It was devised by Edward Johnston in the early twentieth century. The Foundational hand is an adaptation of the Carolingian script from the post Roman era. If you want to learn more about the Foundational hand and how to get started, Jackson Alves has another great online (video) course for beginners. Like with the course for the Italic hand, you can take this one for free as well. These capitals were designed in the early twentieth century by calligrapher and type designer Rudolf Koch. It’s an iconic and vigorous alphabet that is still practiced by many calligraphers all over the world – ideal for large-scale and display work. Fun fact – the Neuland typeface was used for the Jurassic Park logo. There are just so many different modern styles that you can practice today. Another great thing is that once you learn the basics of a specific tool whether it’s a brush pen, broad edge pen, pointed nib etc. you can start developing your very own style. This is probably one of my favorite aspects of modern calligraphy, the fact that you can create your own rules! If you want to get started with it, we have an in-depth step by step tutorial that will cover all the basics along with free downloadable practice sheets. Calligraphy is becoming more popular by the day, and its currently seeing a new ”renaissance” across the globe. A huge part is due to our technological advancements in the recent years and especially the connectivity through social media platforms. Thanks to the internet and social platforms we are able to spread various resources of this beautiful art form – and a perfect example of it, is right this moment while you are reading this article. Hopefully this article gave you an idea of how to art of writing developed throughout history, and it will also help you to choose a script that you would like to learn and practice. Are you struggling with lettering and calligraphy? Do you have a specific question that you cannot find an answer too? Maybe you just want to hang out and network with fellow lettering and calligraphy artists? If so, you should definitely check out our official Facebook group! A place where you can get constructive feedback on your work, ask any sort of questions, meet and network with awesome people and much more! may I join your group please. I’m only new at calligraphy but intensely interested. I am left handed and am having a time trying to find lefty nibs. However, I bought a cheap set of right handed pens to try. Thank you for producing this great site. Hey Eileen, absolutely! Everyone is more than welcome to join in our group 🙂 Thank you for the kind words!